For this show, we gathered together Lauren Agnelli & Amalgamated Muck (above left) and Washboard Slim & The Bluelights (above right) on the stage at Schine Auditorium at Sacred Heart University, across from WSHU’s main studios. Then we added audience members and skillful engineering from our own Paul Litwinovich and Jeremy Hewitt and presented a two-hour live concert by the two groups with a short intermission at the midpoint. It was a fun night of raucous roots music with only a bit of chatting along the way. 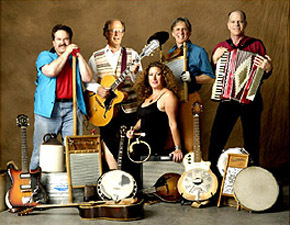 My thanks to Amalgamated Muck (Lauren, Mathew Male, Brian Wolfe, Rose Bengston-Wolfe and Ben Parent) and The Bluelights (Peter Menta aka Washboard Slim, Brooks Barnett, Howard Horn, Cynthia Fabian, Mat Kasner and Johnny Pendergast) for their inspiring and wonderful music making. 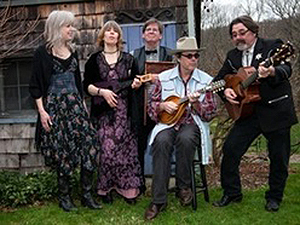 This live program was a warm-up for the Third Annual Connecticut Americana Festival at the Katherine Hepburn Cultural Arts Center (The Kate) which they will headline, along with the Box Car Lilies.